A quick, convenient meal, rotisserie chicken can be eaten right off the bones, but you can add the meat to a variety of other recipes such as soup, chili and tacos. 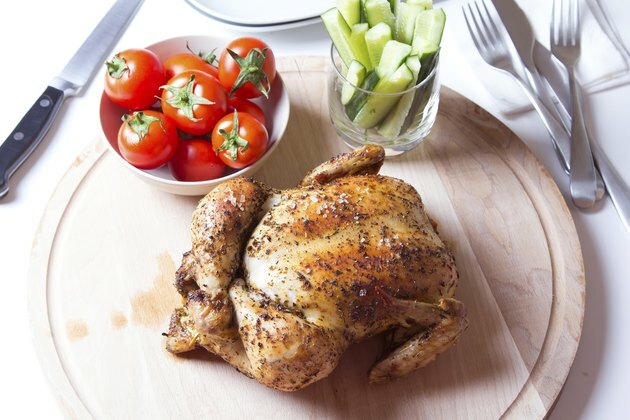 Rotisserie chicken is a good source of key vitamins and minerals, but it also contains a significant amount of sodium, as well as fat and cholesterol, depending on what part of the chicken you eat. In three ounces of breast meat, there are 122 calories in rotisserie chicken. That portion contains 3 grams of fat, of which the saturated fat content of the rotisserie chicken is less than 1 gram. Additionally, the chicken breast has 73 milligrams of cholesterol, according to USDA National Nutrient Database. A chicken thigh contains 183 calories and 10.2 grams of fat, of which 2.6 grams are saturated. That translates to 17 percent of your daily saturated fat limit of 15 grams or less on a 2,000-calorie diet, according to the American Heart Association. That serving of thigh meat also contains 122 milligrams of cholesterol, which is about 40 percent of the 300 milligrams of cholesterol you should limit yourself to each day, according to the AHA. On average, a rotisserie chicken weighs two pounds, so if you ate a half chicken including the breast, thigh and skin, that would account for 96 percent of your daily recommended value for cholesterol, and 46 percent DV for sodium. The good news is that this serving would supply 11 percent DV for iron. The calories in half a chicken amount to 550, according to NutritionIX. Protein is a key nutrient that supplies your body with energy and keeps your muscles and cells healthy. Three ounces of rotisserie breast meat supplies 23.8 grams of protein, which is 52 percent of the 46 grams of protein that women need each day and 43 percent of the 56 grams that men require on a daily basis. A rotisserie thigh contains 22.9 grams of protein. Read More: Is Baked Chicken Breast Healthy? A 3-ounce serving of rotisserie breast meat supplies about 8.2 milligrams of niacin, which translates to 59 percent of the 14 milligrams of niacin that women should have each day and 52 percent of the 16 milligrams that men require every day says Centers for Disease Control. Niacin supports a healthy digestive system and promotes nerve and skin health, as well. A rotisserie thigh provides 205 milligrams of phosphorus, which is about one-third of the 700 milligrams you need each day for healthy bones and teeth, says University of Maryland. All cuts of rotisserie chicken supply small amounts of iron, zinc, potassium and vitamin B-12, too, according to USDA National Nutrient Database. Rotisserie chicken is a good source of many key nutrients, but it also contains a high amount of sodium. Three ounces of rotisserie breast meat contains 279 milligrams of sodium, which is 19 percent of the 1,500-milligram daily limit recommended by the AHA. A 3-ounce portion of rotisserie thigh meat contains 318 milligrams of sodium. Because of this high sodium content, limit how much rotisserie chicken you consume. Fresh chicken that you roast or grill at home delivers the same nutrients as rotisserie chicken, but it's much lower in sodium. Eating a diet low in sodium reduces your risk of high blood pressure, heart disease and stroke. How Many Calories Are In Baked Chicken Thighs?